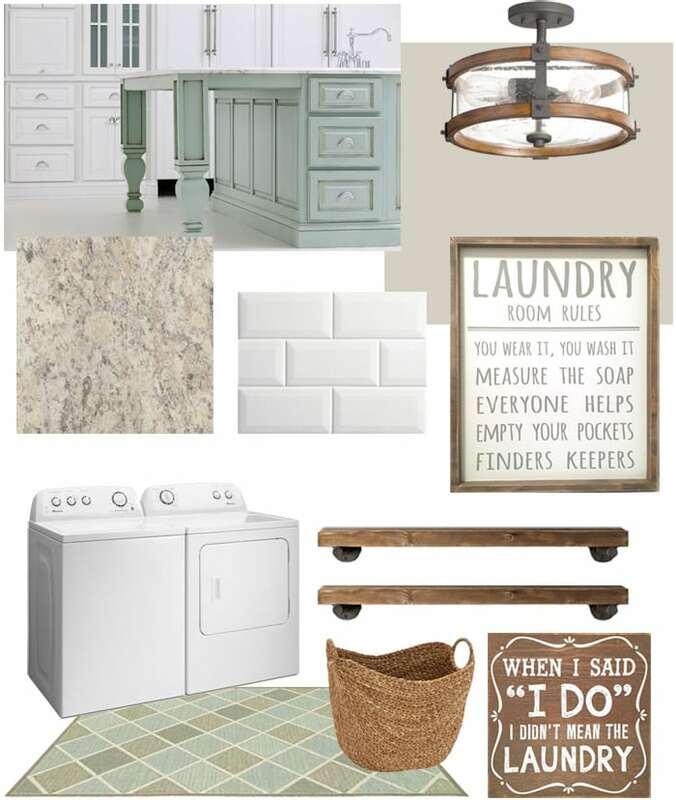 A couple weeks ago I showed you guys the mood board for my laundry room with painted laundry room cabinets. And I’m happy to say I actually made some progress in the room last week. 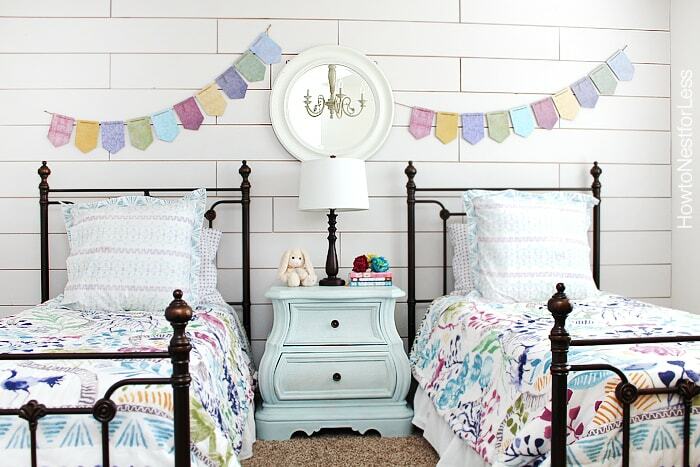 In case you forget, here’s the room inspiration. Yep, I’m pretty obsessed with them! 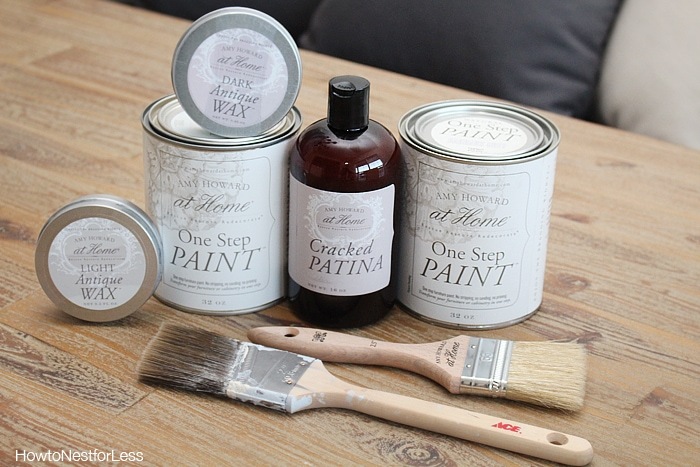 So if you’re wondering about the paint colors I used Amy Howard at Home One Step paint. I fell in love with this paint line last year when I attended a workshop of hers in Memphis, TN. 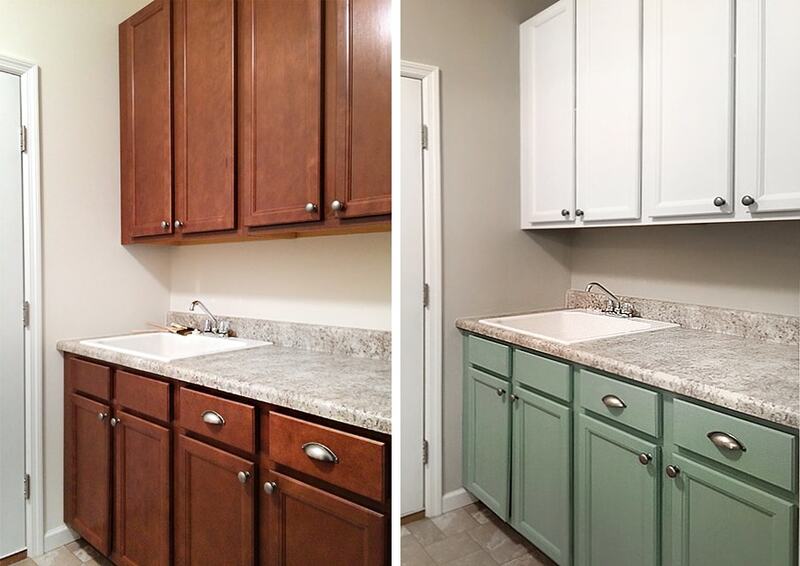 I used Ballet White for the top laundry room cabinets and Barefoot in the Park for the bottom laundry room cabinets. Seriously LOVE the greenish blue color! And if you remember I used Nottoway in Ellie’s bedroom. Seriously the Amy Howard line has the BEST colors! I did two coats on each cabinet and I didn’t even take them off the hinges when I painted them. Yes, I’m that lazy. But you know what, they look great and I had no drip marks. Seriously this paint is amazing. I still need to find a backsplash. I was first thinking about a white subway tile but now I’m eyeing a stone backsplash with lots of grays in it. Might go well with the natural woods I want to bring into the room. 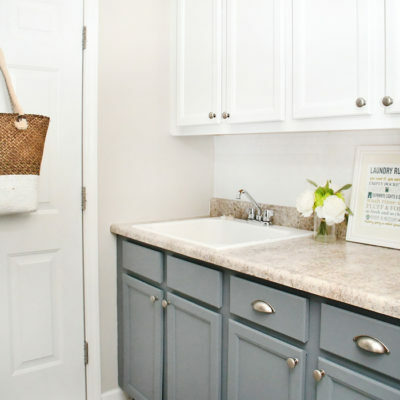 The laundry room sits between the garage and the kitchen so it’s our main access to the home everyday. To say I want this space clean and organized is an understatement! I know it’s just a coat of paint but this doesn’t even feel like the same laundry room anymore. The paint made such a difference! Can’t wait until I get the rest of the space completed so I can show you the full makeover! « Emerson Vintage Light Adapter Video! They look great! Did you wax the cabinets or put a protective coat on them? Would this paint hold up on kitchen cabinets? I didn’t do any protective coats, just the paint. I’ll probably go back and wax in the future and maybe add some dark wax in the corners for depth. And yes, you can absolutely paint kitchen cabinets with this paint!! It’s amazing and holds up really well. It looks wonderful! 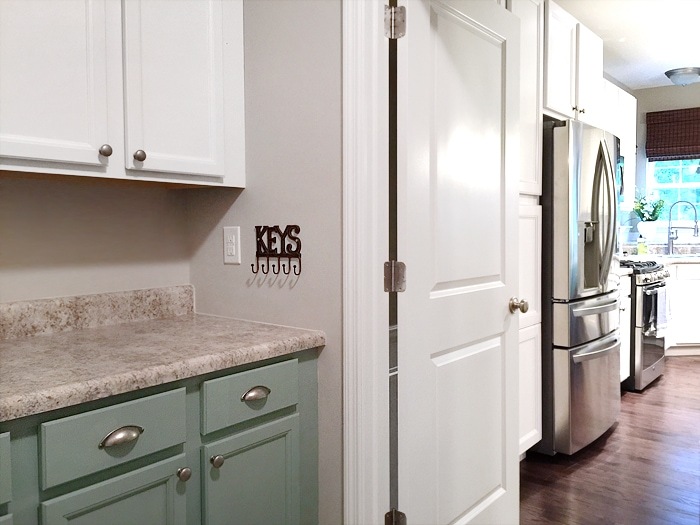 I love the bottom cabinet color and the white top cabinets – it all really looks great together! And the wall paint is perfect! Love it! Did you still go with BM Revere Pewter as the wall color? 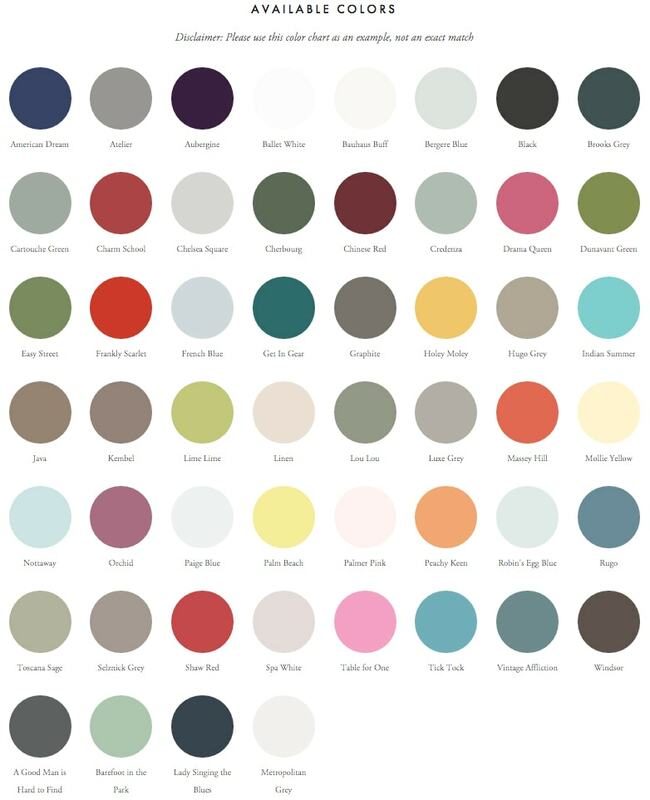 I am trying to get some color samples for painting my main rooms. 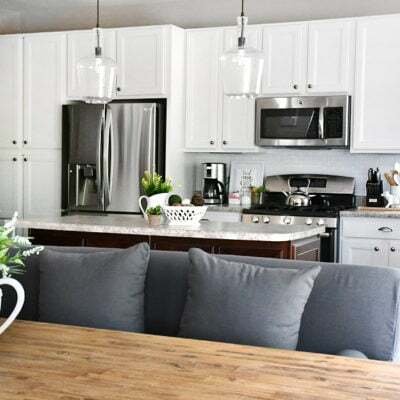 I love the Mega Greige you used in your dining room but I was wondering if it is too dark for my living room…it doesn’t seem too dark in your dining room. But Revere Pewter was another option I was considering…but it seemed too grey. Hard decisions! Thanks for sharing yours – it is giving me some great ideas. I am also thinking of tackling the painting of some cabinets! Thank you!! 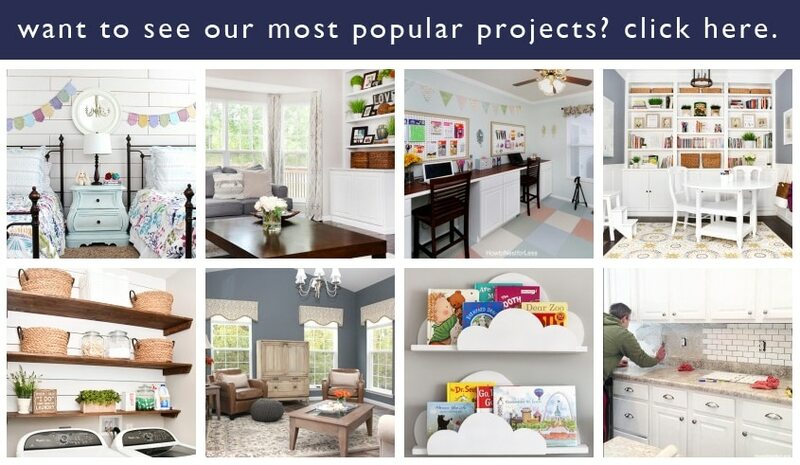 The paint color is Collonade Gray by Sherwin Williams. It’s a tad darker than the Revere Pewter but I think I like it better. More beige than tan and seems to go with grays and tans! This is lovely! 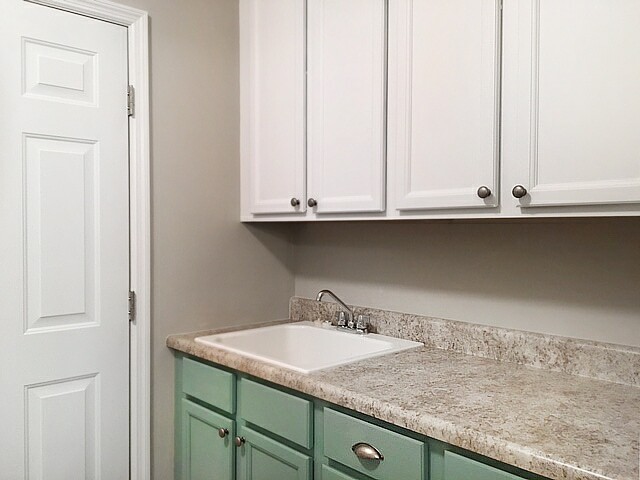 I have been thinking about painting our cabinets too! It’s a big commitment, isn’t it?! Love it though and glad I did it! It looks really nice. I like all your colors. 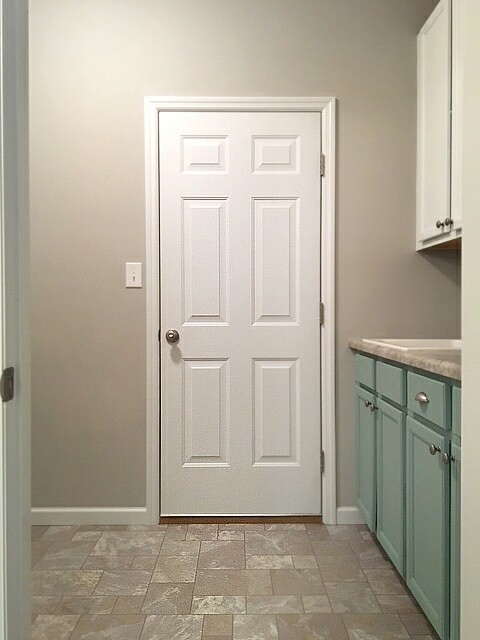 What is the color of the paint on the walls? I really like it. Enjoy all your projects!! Thanks Cheri! The paint is called Collonade Gray by Sherwin Williams! It’s beautiful! I love how it turned out! SO beautiful!!! I’ve been eyeing that paint for a while. Must try! 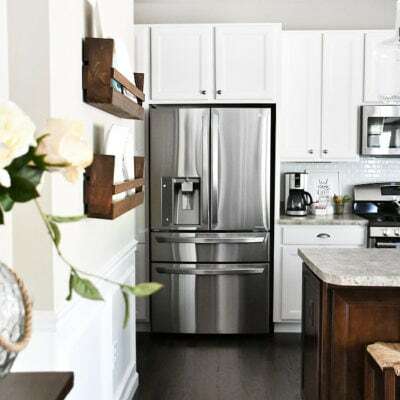 I just discovered your blog and I love your cabinets. I just finished painting mine and I can not believe you didn’t take them off the hinges and had no drips. You must be a painting pro! I look forward to learning more from you! Wow, they look amazing! I absolutely love the greenish color! 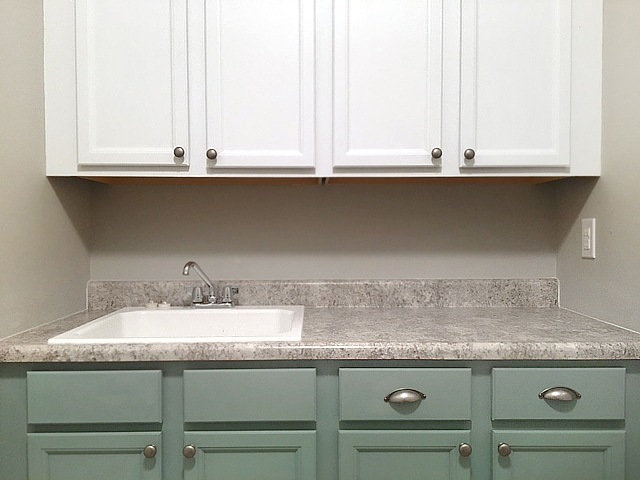 I’ve redone my cabinets with gel stain but have never tried painting them. I’ve never heard of that paint, will have to try it. Did you sand the cabinets at all? Nope, just painted them as is! I did clean a bit first with Simple Green. That’s it! 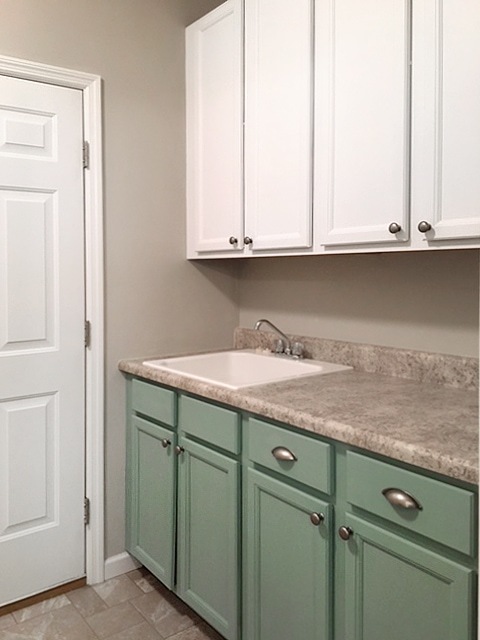 Love the bottom cabinet color!! I think it really pops with the counters. Thank you for sharing at Merry Monday! Love this! 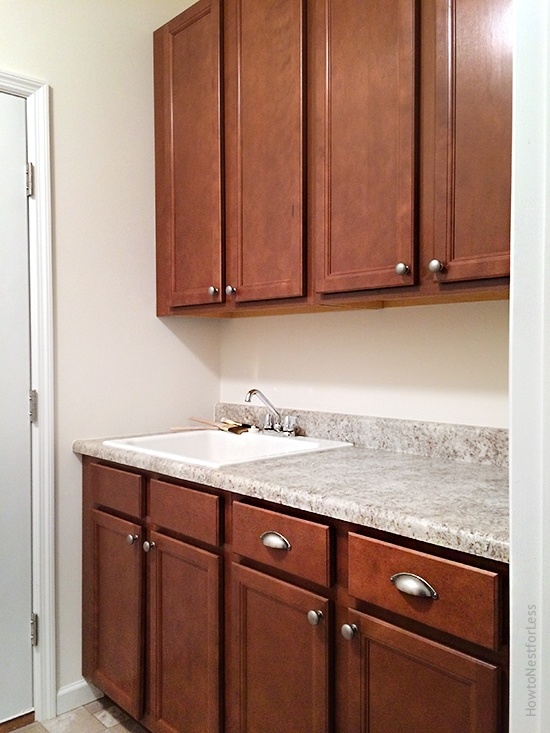 I really want to paint my kitchen cabinets. 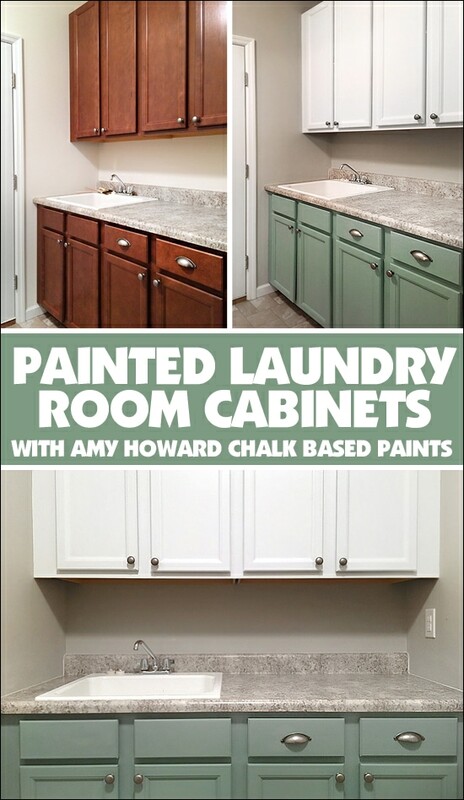 Glad to see the Amy Howard paint works so well. Thanks for sharing at Welcome Home Wednesdays!